Welcome! If you’re looking for a secure retirement in which you can have enough money to enjoy travel, hobbies, and time with family and friends, you’ve come to the right place. 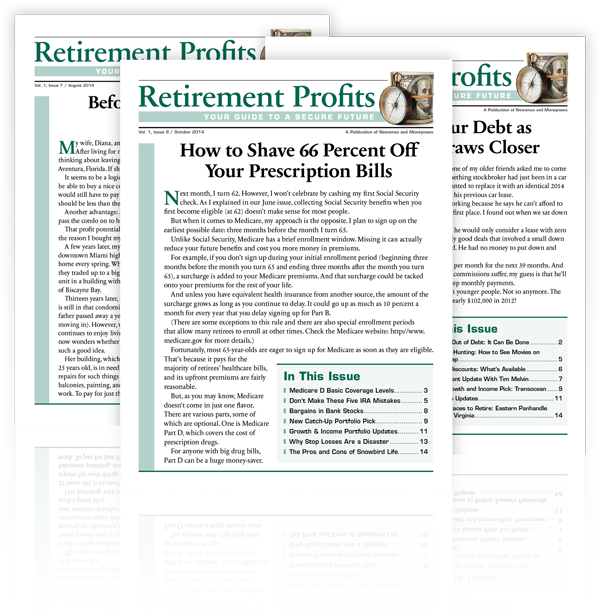 Our mission at Retirement Profits is to show you how to make that happen. We are committed to helping you lead a richer life, full of all the things that make you happy. Retirement is a time of promise and new beginnings. A time to enjoy what’s most important. Where to retire affordably, comfortably, and luxuriously. In addition, we’ll get into the ins and outs of financial vehicles often pitched to retirees, like annuities, reverse mortgages, and living trusts, so that you’ll know whether they’re worthwhile for you. And we don’t stop there. We will give you tips for cutting everyday expenses, plus strategies for “catching up” if you haven’t saved enough in your retirement nest egg. Our retirement expert, Jack Kahn, has over three decades of journalism experience and contacts in the industry. So you can bet that he knows where to go to get the answers to your most pressing retirement questions. And our investment expert, Tim Melvin, has over three decades of experience in investing. Having lived through and advised investors during the crash of 1987, the 1990s dot.com bubble and the financial crisis of 2008, Tim has seen it all. He isn’t fooled by stock promoters touting the latest way to make a buck fast. And as a value investor, he knows the difference between real opportunity and, well, a bunch of malarkey. His picks will offer you the highest possible yields with the absolute least amount of risk. Between the two of them, you’ll get a double dose of powerful retirement advice every month — advice that will reward you and your family for decades to come. Copyright © 2015 Retirement Profits, All Rights Reserved.